I had the graphic corruption bug in the tank battle of SC2 on my Saturn with V17. It seems like it is fixed now with V18. So, yesterday I was finally able to finish the game without any problems! Thank you guy so much!!! Hello everyone. I am currently playing scenario one. I am having issues with the spells not showing up at all or being extremely glitchy. Also the floor sometimes turns black or transparent. 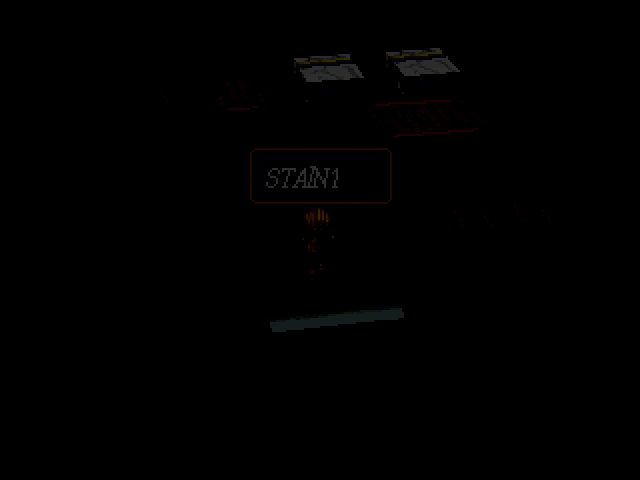 I've messed with the Yabause settings like SH2 and tried changing it to debugger and it temporarily fixed the issue into i got to chapter 3. Now it's back again. Does any one have any suggestions as to what might be going on as well as a solution? Any help is appreciated. Thanks! Not sure if this is a patch issue or something my end. 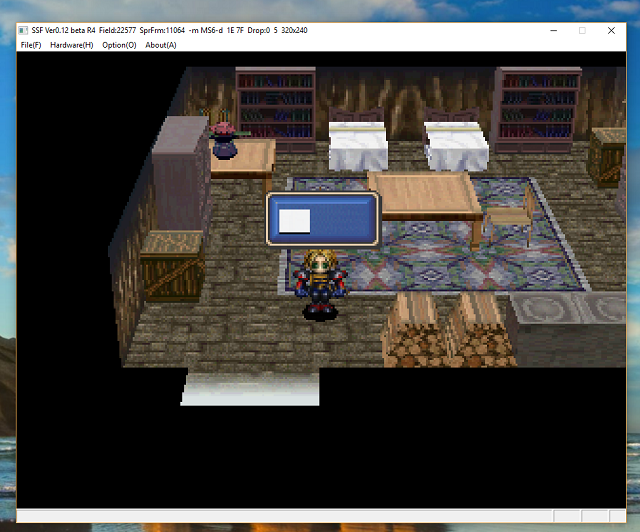 When I enter David’s Room, in the Elvan Village, I get a text box pop up with a white square in it. It stays in the centre of the screen until I exit David’s Room. Chinagonuk wrote: Not sure if this is a patch issue or something my end. Could you host your savestate / game .BIN somewhere? Shall see if it does the same for me. Is there a way i can share it over the forum as an attachment or something? Ok done (I think lol). Okay, so the error is happening for myself as well using your save. Whether it's something specific to your patched CD that's carried over I'd have to try with another save. That 'box' comes up and disappears almost immediately. It more than likely has some sort of text. Is there a number after that 1? It appears to be a location line, like the one that says "David's room", but that line doesn't exist on page 1, it's 2-82. And there aren't any blank lines in STAIN on page 1. If this is truly V19, my suspicion turns to save state usage. Unfortunately it's so fast I can't see it clearly, and even though I'm pressing the screenshot button like mad, that is the only thing I'm picking up. As for when it happens: pretty much any time you enter into David's room. Coming out and going back in results in the same thing occurring. Got it fixed up! It turns out the 1-58 line is a coded pointer to the various location lines, so it was actually reading the 2-82 line. The issue is that I was using David's name line combo in this line and it didn't like it. I spelled David's name out and it worked fine. The reason I use the name combos anywhere I can is so if people decide to use the editor or gameshark to change the names, they change everywhere. So now if they changed David's name to Bill, when they went into this room it would still say David's Room. We probably could take this opportunity to review this location name. Something like Leader Quarters. I don't know if he's considered a chief... I believe they all refer to him as their "leader". It's probably all the same. At any rate, I'm attaching the fixed file. Anyone interested can replace this file in the SF3Patch\files\s2 directory and re-run the patch. Good job, LF. Maybe could just call it Secret Room or similar. I think I may have found a typo in Sc2 Ch3 in Barrand Prison while talking to Donhort. "However, it doesn't look like we'll be allow to leave." "However, it doesn't look like we'll be allowed to leave". Excellent catch! I'll get it fixed up. This is a strage one. After battle 16 i return to elbesem village and pickup the Robot Eye and Power Wine. I go to the HQ and Medion is holding both items. I use the Power Wine on Julian but the text says “Medion uses the Robot Eye” instead of Power Wine. If I give the Power Wine to someone else, who is not holding the Robot Eye then the text is correct. Well, you do use the wine on Medion (not Julian) so there is no name mix up. The item name in this message grabs from a slot that is filled by the game. It's odd, but I'm calling it a glitch. I'm guessing if you did anything but exactly what you did, this would correctly fill the item name. I can't reproduce this, but I'm not sure exactly what you did. If I were to guess, I'd say the last thing you did was get the Robot Eye and the very next thing you did item-wise was use the wine. I don't believe there is anything to be done about it in the patch, but thanks for reporting! Actually I used the wine on several different characters. The glitch occurred each time Medion was holding both items. My exact process was; clear battle 16, head to church, make a save, promote some characters, get the Robot Eye, trigger cutscene with village chief, get Power Wine, head to HQ, use Power Wine. I figured it was more likely a game glitch than a translation error. Over the years i’ve witnessed a few strange things like this. This seems similar to another odd one I've found. If a lizardman gets feet-frozen-in-place status effect, It will show the hero's name in the message. I believe this only happens with the lizardman. Can you reproduce it on the original version?